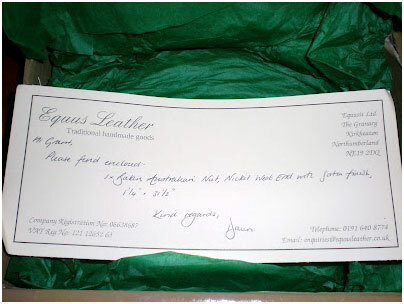 Equus Leather is owned and operated by Charlie Trevor and Dawn McCormack in the Northumberland region of the UK. Charlie manages the leatherwork and Dawn handles photography and the business administration. Charlie has been producing leather and bridle work since 1995 and his products can be found all over the world from Europe, to the US to the Middle and Far East and Australia. 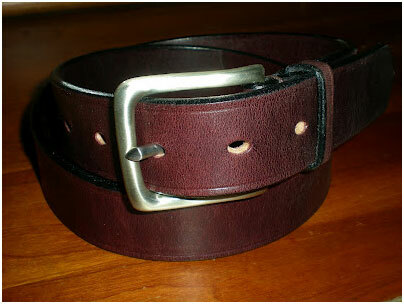 Fortunately, I had the opportunity to work with Charlie to build a custom bridle leather belt. This was my first belt made and cut to my specifications and working with Charlie was a delight. Charlie explained the selection and cutting process step by step and offered recommendations for color, width, buckles etc. We agreed on a bridle leather belt in Australian Nut which looks brown in artificial light but in natural light has a distinguishing Burgundy finish. My belt has no stitching and or raised edges, which is available but the process takes considerably more time and effort and increases the cost of the belt while simultaneously decreasing the formality of it. We cut a 1 and 1/4 width which is standard for a dress belt but with seven holes when most mass produced belts come with only five. We chose a West End buckle in Satin finish which to complete the belt. 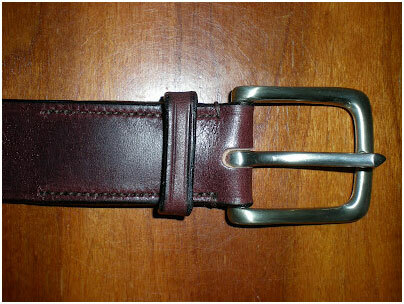 Since the last belt I acquired had a shiny buckle we chose a matte finish on this piece. 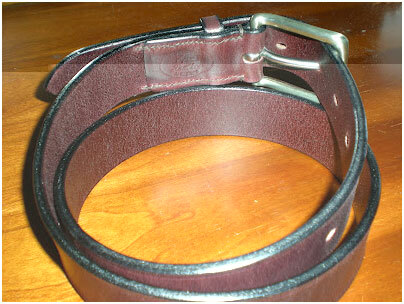 We also cut the belt to a specific length to ensure the best fit. When fitting a belt the common knowledge is to wear a belt two sizes larger than your waist size or the size of your trousers. Of course, if you’re going to go all out I recommend no belt loops at all, but side tabs on all of your trousers just seems pretentious. So, if you wear a 30 trouser you should most likely be wearing a 32 belt. However, as it so happens many men wear their belts to large and end up buckling the belt on the last hole which is ghastly. You should never buckle your belt on the last hole and in reality it shouldn’t have to reach further than the second to last hole. Unfortunately, many men like me are in between sizes and it can be difficult to properly achieve this without cutting the belt exactly to specifications. In steps Charlie who cut a 31.5 length which suits me perfectly. Prior to our working together I was not aware of the all the properties of bridle leather. Fortunately, Charlie is an expert. Bridle Leather refers to the way that a piece of leather (cow hide) is finished at the tannery. 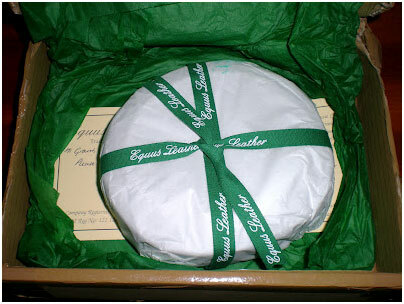 It is used in saddlery for horses and is typically expected to last for 10 or more years of use. It has both the Flesh and Grain side of the leather stuffed with greases and finished with wax. This is generally a labor intensive process, and thus expensive. Only the best grades of leather are treated in this manner. It would be uneconomic to treat poor quality leather in this way. Today, few tanneries produce good bridle leather. Equus only utilizes leather from J & E Sedgwick and J & FJ Baker who are widely known to produce the best bridle leather in the world. There are three major characteristics of bridle leather. 1. It must have good depth of color and be attractive to look at while aging well and it must not have natural imperfections that weaken the leather. 2. It is expected to be smooth, comfortable and flexible to handle. 3. It is expected to be both strong and durable. All Equus hardware is made from a solid metal, such as brass, stainless steel, nickel or sterling silver. Charlie does not use plated fittings that inevitably rust over time. All hardware is sourced from Walsall or Birmingham in England and is engineered for the purpose intended. All but one of the belt buckles goes through a polishing process that produces either an exceptionally high gloss finish or a satin finish, depending on requirements. The majority of the buckles used are actually harness buckles and include the West End which was my personal choice. I’ve worn the belt both in casual and semi-formal occasions for work. I’m sure it will continue to wear in well. I just hope my waist does the same. Got one of these. Superb.